The following description is taken from a leaflet which is available in the church. It is supplemented by some photographs, many taken by David Westwood. 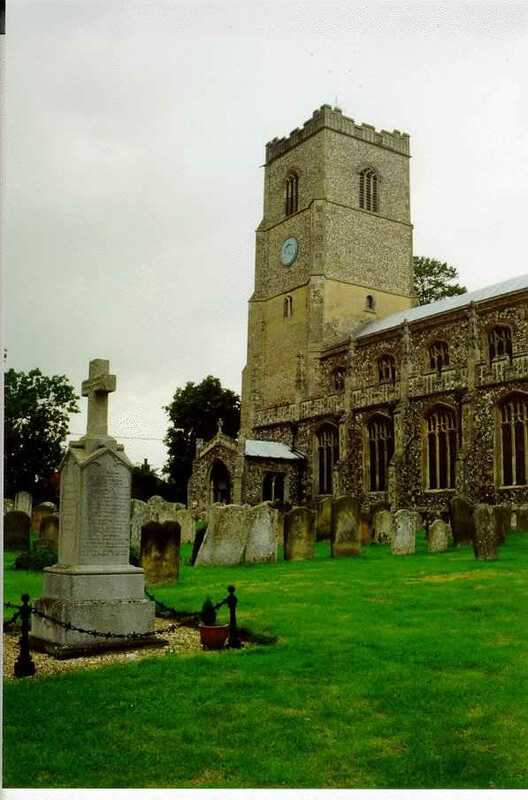 This is one of the Group of Parishes, which comprises:- Fincham, Marham, Shouldham and Shouldham Thorpe. 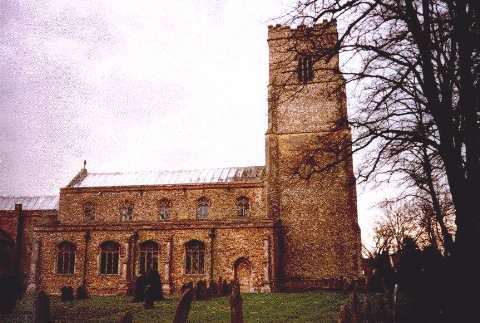 This church was extensively rebuilt about 1450 with all the grandeur of the Perpendicular period. It is on the exact site of the earlier St. Martin’s church and partly on the original walls. The famous Norman font here came from a second church in this village, called St. Michael’s Church, which was pulled down in 1744. The exterior of this church is so dramatic that it invites visitors to walk around outside first. The tower is both lofty and well proportioned with a fine stepped and panelled parapet. On the buttresses you will find various designs including the arms of the Fincham family, who were the principal donors for all the Perpendicular period work in this church. “M” for Mary and “IHS” can also be seen on the buttresses. The tower starts with a panelled base course and ends with a very fine weathervane. It has a large West doorway, which is very finely moulded, and its hoodmould ends with recumbent lions as stops. It has quatrefoil designs in the spandrels. Above the doorway is a great west window of 4 lights. The S. Porch is also Perpendicular period, c. 1450, although you will read the date 1852 on its parapet, which was the date of its repair. The W half of the parapet has again been restored recently. There is a fine gargoyle just below the apex of the parapet, and you will soon find that gargoyles are one of the many outstanding features of this fine church. The S. Aisle looks magnificient from the road with its 4 big 3-light windows with their stepped transomes, and above there is an elaborate parapet with flushwork panels and tall crocketted pinnacles. The gargoyles here are most extraordinary: one looks like a lady with the devil on her back, and another has a pair of figures lying flat with their feet in the air. Fig. 1 shows an amusing double headed gargoyle with a beard. The clerestory is built with a mixture of brick, flint and carstone, which is most attractive. 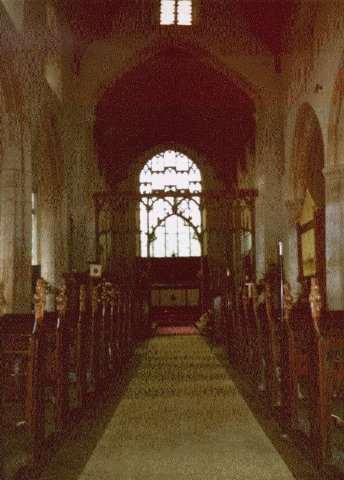 There is an E window above the chancel arch, and a stair turret to the former rood loft, sited in the angle between the S Aisle and the chancel. 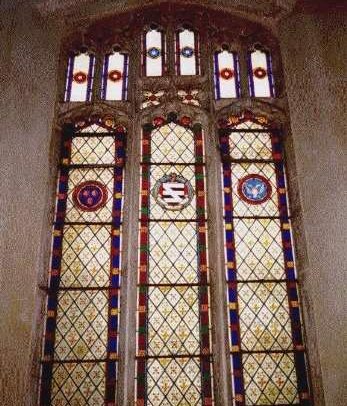 The East window is a great example of the Perpendicular period with 5 lights and 2 tiers of stepped transomes and fine tracery. On the N side of the chancel is a 2 storey vestry, built by Sir Nicholas Fincham, who was buried beneath it in 1503. The N side of the church is plainer, but you should go to see its great gargoyles. There is more carstone on this side. 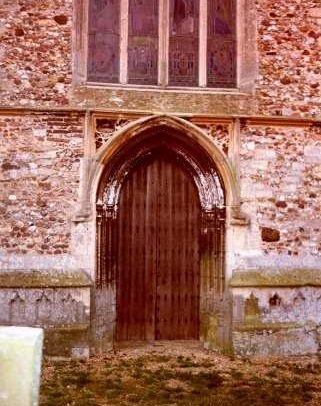 As you enter by the splendid Perp S doorway you will notice shields in the spandrils over the doorway, and you will pass the original stone seats of the porch and the Holy Water stoup in the corner. Again the height and elegance of the Perpendicular period is most striking with an abundance of soft light from the great windows. When the people lived in low thatched houses it must have illustrated Isaiah’s message from God that “My ways are higher than your ways and my thoughts than your thoughts.” First the tower arch is immensely tall with many orders of mouldings and shaftings on both sides. The East buttresses of the tower project into the nave. 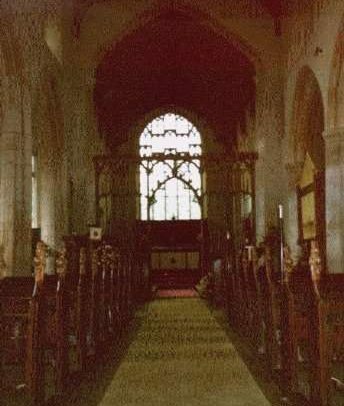 Then the fine slender piers which carry 5 bays of double chamfered arches on each side of the nave have a particularly elegant design. In section they are an elongated lozenge shape with polygonal projections to each side. The S arcade piers have capitals, but these are not repeated on the N side. The roof has alternate large and small hammerbeams with arch braces, and the hammerbeams are embellished with carved angels and grotesques. The S aisle roof is also largely original with tracery in the spandrils of its arch braces. S side: Mary, Joseph, and manger with heads of cattle and star. E side: Three Magi bringing gifts, wearing crowns. N side: Adam and Eve with serpent in tree of knowledge (repaired). W side: Baptism of Jesus with St. John the Baptist and a Bishop. The Bible Texts painted on boards and hung around the walls make an excellent feature of this church. They are dated, 1717, and you will find there two new ways of spelling “Caesar”. There are also the Creed and the Lord’s Prayer on boards, and in the tower can be found the Ten Commandments on two more boards. The Screen is an absolutely splendid example of 15th century work. It is very high with a much wider than usual entrance arch. At the apex of this arch can be seen the arms of the Fincham family, indicating that they were the donors. Notice the double cusping of the arch and pinnacles to the transome tracery. The base panels have their original floral design painted in colours, now well mellowed with age. The poppy heads from the earlier benches are now seen on the Victorian pews; they are nearly all different and deserve careful study. The nicely carved pulpit is Victorian and you can see tester from the previous pulpit, now being used as a table near the S door. The nave floor has ancient brick pavings which are probably original. There is a squint or Magioscope, from the N aisle cut right through the E respond of the arcade and the thickness of the wall, in all about 6 feet, which gives a sight of the Communion Table. The chancel was restored by Miss Hebgin in 1870, and you will find there several memorials of the Hebgin family. There are plenty of interesting memorials here. In particular the Rev. 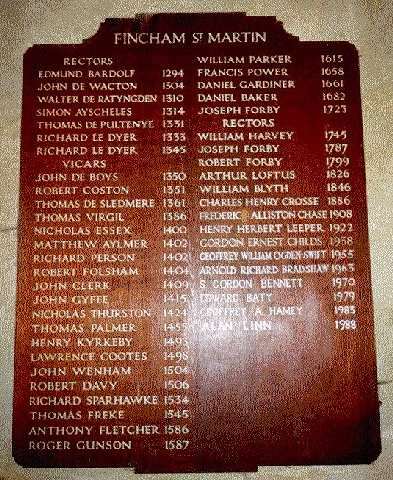 Daniel Baker, l722, was Rector here for 40 years; his life was overshadowed by bereavement, because he lost his mother, wife and 8 children within a short period; possibly due to an epidemic; this spurred him to the mournful task of writing the book of Job in verse. The brass on the floor depicts a woman in a shroud, but her inscription is lost. The style of the brass indicates that it was made in Norwich in the first half of the 16th century. There is also an indent of a heart brass, which has been lost. The bells were all recast into a new ring of six by the Loughborough Foundry of John Taylor & Co. in 1976. The tenor is 7 cwt. 151b. in B-flat. The following information, from a group of historians at the University of East Anglia, was added in June 2013. We are a group of four. We’ve looked at the general architectural style and composition of the building relative to other churches in the area where we know building work was going on in the first half of the fifteenth century. 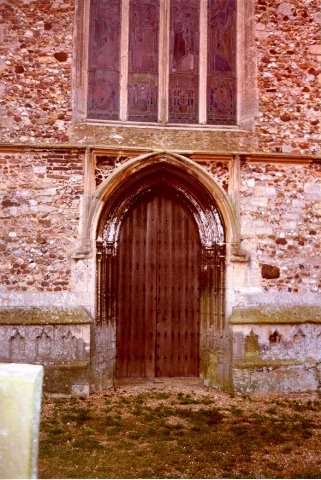 We’ve also looked in detail at the building of Fincham church using the evidence of masons’ marks and stonework. We’ve looked the composition and decoration of the rood screen, at stained glass and at the roof carvings. We’ve also examined contemporary documentary evidence and later antiquarian material concerning those who supported the church financially in the later middle ages. Taking all this evidence together we believe that there was a major building campaign going on in the 1420s and 1430s, and that it was this campaign that created much of the church as it appears today. Clearly there were restorations in later periods, most notably in the mid nineteenth century, but essentially what we see today was a product of the early decades of the fifteenth century. 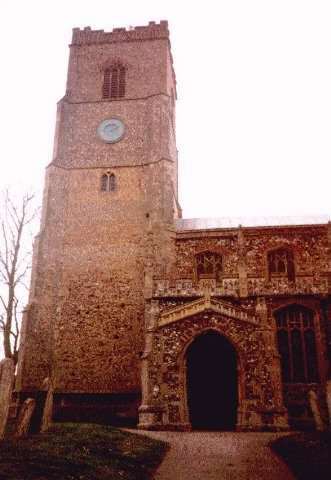 The tower was obviously built in stages, one stage being marked by the Fincham heraldry which probably refers to the legacy left by Simon Fyncham on his death in 1458, but the tower would not have been completed until the end of the fifteenth century. Certainly there is another bequest to it in the 1470s. Our research on the rood screen – undertaken by one of our number – suggests that much of it is original and probably dates from the same period (1430s) or perhaps just a little later, perhaps 1440s/1450s. It is very fine and there appears to be only a small amount of repair or additional woodwork of a later date. The painting is likely to be original, but without doing a scrape and full analysis it is not possible to be certain about this. We can certainly send you more information on the screen if you wish. 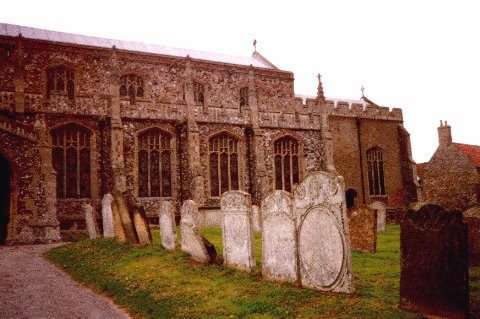 The Fynchams were a leading family in area over many generations, and there is evidence that they supported the churches of St Michael and St Martin Fyncham. There were a number of leading families, of which they were probably the most active and wealthiest; others included Geyton, Shuldham, Trussbut, Talbot. 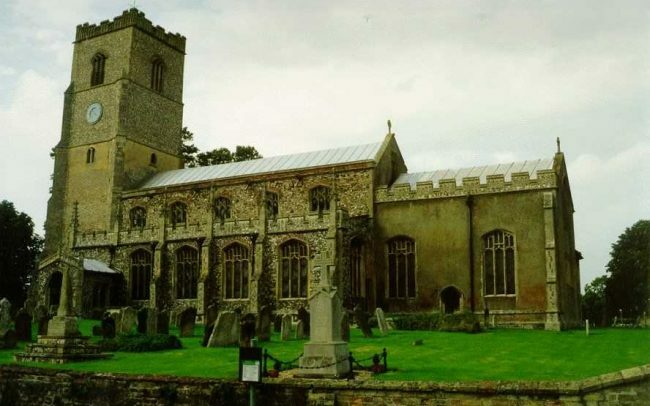 There is evidence that Simon Fyncham bought up a lot of land in the area in the mid fifteenth century and his son John became wealthy as a lawyer. 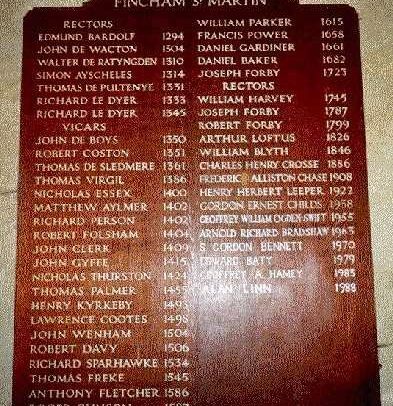 It’s likely that all these families put money into the church but it happens that there is more evidence – though not a lot – for Fyncham activity. 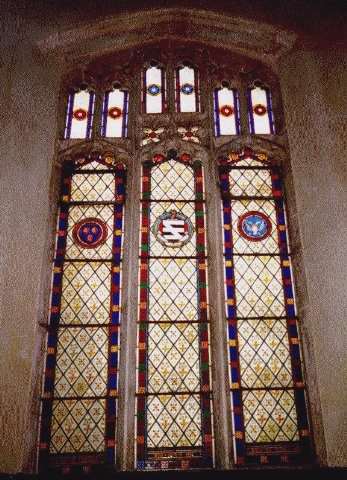 The medieval glass in the chancel shows angels playing different instruments, and is typical of Norfolk glass of the 1430s. 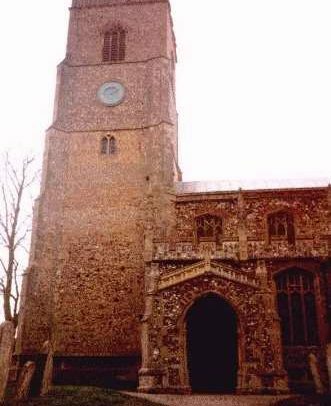 The figures on the roof posts are very interesting and can be compared with those in the north aisle at Mildenhall and one the roof posts at Outwell. The connection between Outwell and Fincham is through the Fyncham family, the connection between Mildenhall and Fincham is through Thomas Barton who held land near Mildenhall and at Barton Bendish. The date of the roof decoration in each of the churches mentioned here is the same and the message of the carvings seems to be the battle between good and evil, virtue and vice, symbolised by the figures of the angels, the demons and the other figures which appear human but are distorted either by long tongues, or animal faces. The Church’s teaching on good and evil was one of the areas of basic instruction that priests were obliged to give to parishioners, through preaching and teaching, and imagery must have helped them to do this. Figures on roofs of this type appear to be quite special to this part of Norfolk and to this particular period. As in the past, still today this great church is the house of prayer, used by the people of Fincham and maintained for the glory of God. 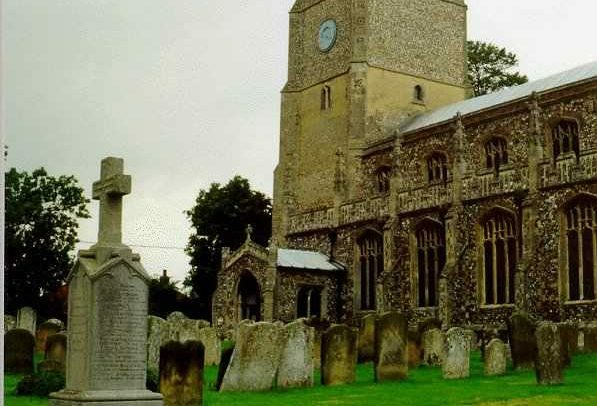 Our ancestors came from the village of Fincham in Norfolk, England. The name is Anglo-Saxon, and probably means “the home with the finches” (though you may find another explanation if you explore the site). If your name is Finchum or Flinchum or Finchem, these are different spellings of the same name, and you are just as welcome. If you live in Fincham, or have an interest in the village and its history, you are welcome too.